We drove by this stop on our way to the Graham Bradley Collectors tractor show held at the Gilmore Museum in Hickory Corners, Michigan and noted that if possible we would like to stop on the way back. Mission accomplished! The Whistle Stop Restaurant and train museum features items from the private collection of Dale and Anne Ward who started collecting, amassing a large enough collection they decided to share it with others by opening a museum and restaurant. While I didn’t have the time to go through the entire museum there was plenty of cool memorabilia inside in the diner (which had great food and the best chilli I have had in quite some time) and items outside for visitors to enjoy. Inside are calendars from the 30’s and 40’s and more along with neon signs, and even the lights in the dining room came from a rail depot in Chicago, Illinois. Diners can enjoy trains rushing by overhead while eating great food with service from a dedicated staff. Once dinner was over, I headed outside and enjoyed the signs, cars and all things railroad situated around the diner, and keep in mind that I did not even touch the tip of the iceberg by visiting the museum that includes china and silver from railroad lines, a complete railroad depot, lanterns and more. Outside, my favorite experience was a walk through a caboose. 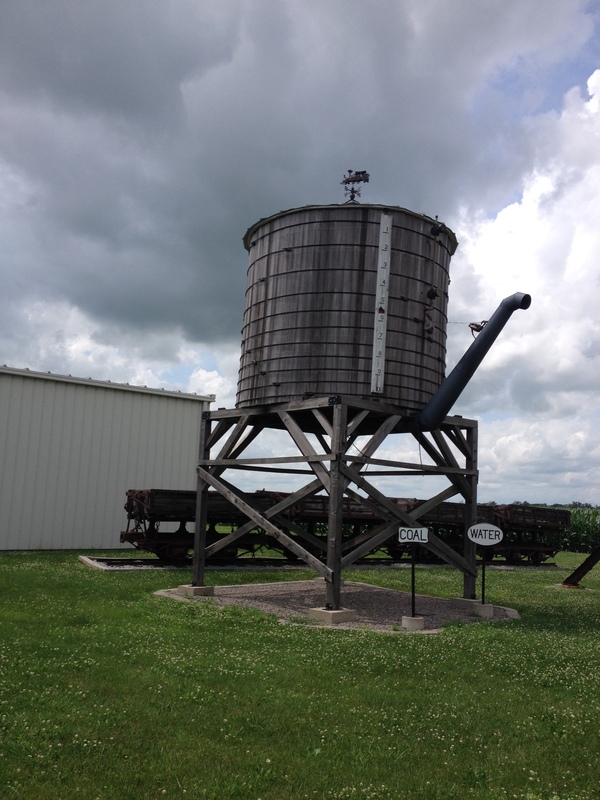 This water tower they have onsite reminded me of Petticoat’s Junction. I almost expected Billie, Bobbi and Betty Joe to flip towels over the side and swim to the top! Although the glory days of the railroad may be past, some of the beauty of that era can be relived by a stop at this great museum and diner located at Monon, Indiana along Route 521. Check out their web site at www.mononconnection.com or call 219-2534101 for details. Agricultural enthusiasts will also enjoy the ag equipment on display as well.